The rocky pattern repeats to the south. Looking beyond the ridge connecting Jupiter Mountain (off-screen right) with Grizzly Peak to the left, with sun and snow. In the background, McCauley Peak (13,554) crowns Echo Mountain (13,309) with some sun on the western slope, Organ Mountain (12,580) is directly above Grizzly, followed by Amherst Mountain, Emerson Mountain, Sheep Mountain (13,070) in plenty of sun, and Sheridan (12,795), no doubt named after the Indian killer. 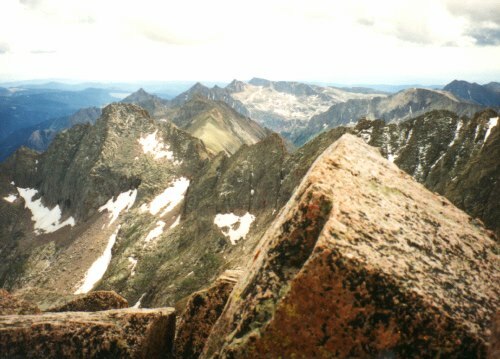 The broad grey ridge to the right is Mount Valois (13,185) Windom's peak consists of angular blocks of pink granite as seen in the foreground.